Electro-Sensors will be exhibiting at the Wisconsin Agribusiness Classic trade show. The show runs from Jan. 15-17, 2019 and will be held at the Alliant Energy Center in Madison, WI. 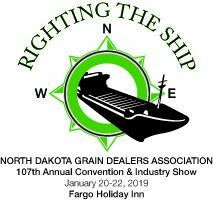 Electro-Sensors will be returning to the North Dakota Annual Convention & Industry Show hosted by the NDGDA (North Dakota Grain Dealers Association), in booth 43. The show will be held from January 20-21 at the Fargo Holiday Inn in Fargo, ND.